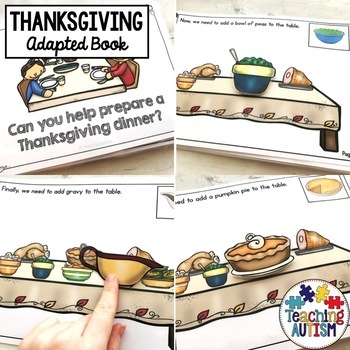 This adapted book is a fun and engaging addition to your Thanksgiving unit. 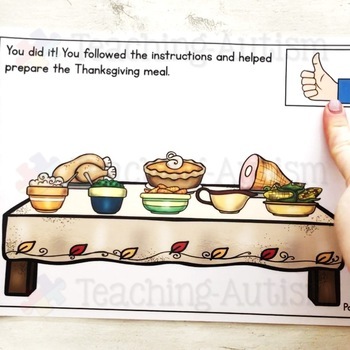 The adapted book is a great way to have your students work on following instructions. It is also a great way for you to encourage your students to pay close attention to detail. Students will need to read - or be read - the instructions on top of each page. Then, they follow the instructions and choose the food item to add to the table. This is a great way for students to watch the sequence of them making their Thanksgiving feast. 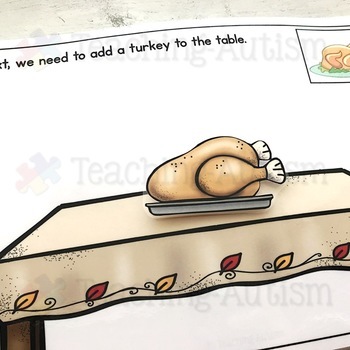 This resource will help learners understand how to put together a Thanksgiving meal. It can also help give them the confidence to help their own families this Thanksgiving too. I recommend laminating each of the pages and binding together as a book. This makes the book more accessible for your students and easier to store. I also recommend cutting out and laminating each of the individual food pieces. This will help them be stronger, longer lasting and reusable. This is a great activity that you can put away and pull out each year. 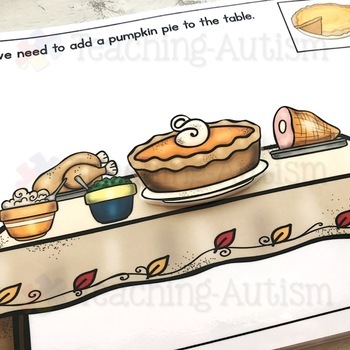 This adapted book will be a fantastic addition to your Thanksgiving unit. It gives your learners the chance to work on important sequencing skills. Each page contains the next step in the process. This allows students to watch their meal growing into a feast. This adapted book comes in both col or b/w option for your printing preference.